NETHERLANDS: Dong Energy has placed a winning bid of €72.70/MWh to build the 700MW Borssele 1 and 2 offshore wind projects in the Netherlands following a competitive tender. The bid, which excludes transmission costs, is among the lowest offshore prices to date. Dong will receive the €72.70/MWh support prices for the project's first 15 years of operation, after which it will be subject to market prices. Dong has up to five years to build the two 350MW projects, 22km from the Dutch coast. It is expected both will use approximately 100 turbines in total, meaning turbines of at least 7MW capacity will be used. "With Borssele 1 and 2, we are crossing the levelised cost of electricity mark of €100/MWh for the first time, and are reaching a critical industry milestone more than three years ahead of time," said Dong head of wind Samuel Leupold. 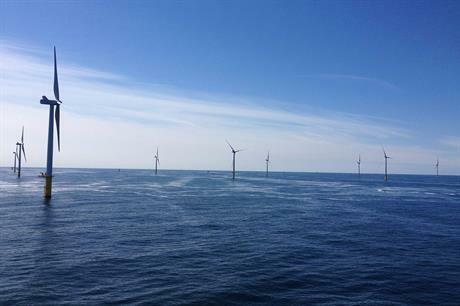 The Borssele tender is the first of five 700MW tenders to be awarded by the Dutch government between 2016 and 2019 with a view to adding 3.5GW of offshore wind. The tender for the next 700MW site, Borssele 3 and 4, is expected to be opened in August 2016. The Dutch government has supported the development stages of the project, easing project costs. After consultation with the industry, the Dutch authorities tried to remove many of the cost and time barriers for developers looking to bid to build and operate the projects. The government took on the burden of preparing all the site data required to help with bids, including the environmental impact assessment. The final project and site description for the Borssele sites was placed online at the Netherlands Enterprise Agency website. "The low price is due to the fierce competition between the companies that made a bid", the Dutch government said. Dutch minster for economic affairs Henk Kamp said: "It has never happened before that a wind farm can be built at such low cost. The Dutch system, whereby companies must compete with each other and the government regulates all conditions to build the park, has proved very successful. This cost represents a major breakthrough in the transition to more sustainable energy." In November 2015, developers RWE Innogy and EDP Renovaveis joined forces with investment firm Macquarie Capital to bid in the tender. Dong also beat a consortium comprising Dutch firms Van Oord, Eneco and oil and gas giant Shell to the project. Dutch offshore grid operator Tennet is responsible for construction, operation and ownership of the projects' substations and export cables. Connection of the project will cost €14/MWh, according to the Dutch government. The low cost is set to save the Dutch government €2.7bn from what it had budgetted for the project over the 15-year subsidy contract. The Netherlands has approximately 520MW of offshore wind capacity installed in the North Sea. The previous lowest winning bid for an offshore project had been Vattenfall's €103.1/MWh for the 400MW Horns Rev 3 site in Denmark, which also excludes connections costs. WindEurope (formerly EWEA) CEO Giles Dickson said: "It has been clear for some time that the costs of offshore wind are falling rapidly. This tender goes beyond even the most optimistic expectations in the market. The €87/MWh (including grid connection) is significantly lower than anything we've previously seen. It now puts offshore wind in the same cost range as conventional power generation."